This thread is devoted to comments, bug reports and fixes and discussion about the DS1 Legendary Mod for Dungeon Siege 2 and Dungeon Siege 2: Broken World. Download all three parts to the same location and run DS2_Legendary_Mod_v1.01_Setup.exe. Thanks to MEGA Limited for hosting the file. The link goes to a separate page where the mod can be downloaded. I recommend right clicking and opening in a new tab or window. 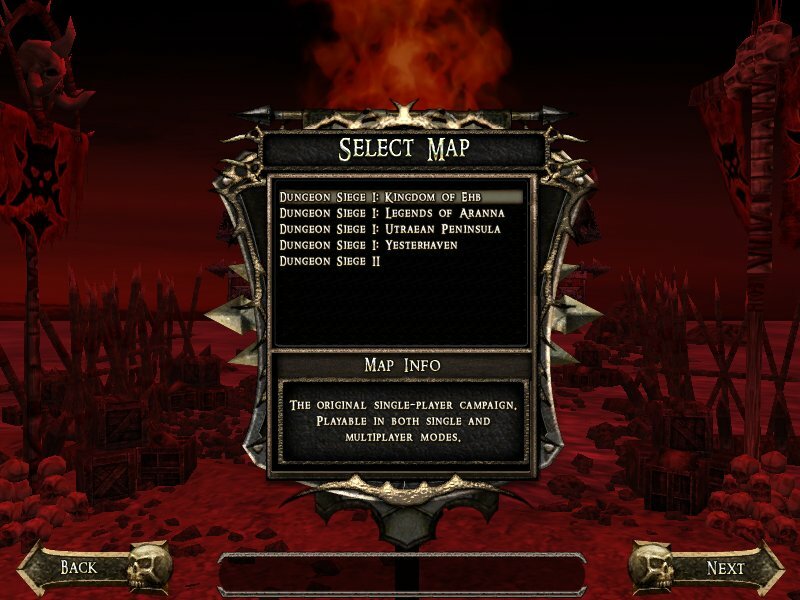 Please note that the mod must be installed in the Dungeon Siege 2 resources folder even if you own Broken World. Unexpected glitches will occur if you don't. The installer version also includes a number of min-mods and a simple mod manager to enable them, which isn't available if you download the mod as separate modules below. Thanks to MEGA Limited for hosting the files. Each link goes to a separate page where the module can be downloaded. This mod allows players the opportunity to play Kingdom of Ehb, Utraean Peninsula, Legends of Aranna and Yesterhaven from the original Dungeon Siege in Dungeon Siege 2 and it's expansion, with all the benefits that provides. Think of it as more of a remastered version of the original Dungeon Siege than a mere port to a newer engine. Elys All*Saves or Elys' Succubus Manager is recommended to play the mod, which most users of this site probably already use. However either use v1 of All*Saves or turn off the seefar option in the launcher as the mod incorporates seefar moods directly in the maps for better balance without the glitches and distortions caused by using a too high a level of seefar in the launcher. Version 1 of Elys All*Saves is distributed in the installer version in original DS2 (v2.2), Broken World (v2.3) and Steam versions. Link to thread containing user made maps from DS1 that have started being converted to DS2. Please put any comments, suggestions, reports, etc. about user made maps into that thread rather than here. All maps should be fully playable from start to finish but please expect bugs as they are still only alpha versions. So here are the screen shots from my blog with comments on the pictures. The Kingdom of Ehb Map and Yesterhaven Map. On my last run through of the Ehb map I did not find any errors, so at least from my point of view Ehb is ready. The Yesterhaven map has one bug with Gwen, otherwise it plays great. See my blog for screen shots of these maps. More notes and images on my LoA test run. I finished with the transport center and saved the transport system. Like the use of the DS2 teleporter hope you plan to add these at some point in the future Iryan. I did note that traveling back through the teleporter from Demlock's Cut the the transport center put me in a very dark room. Not that that is a real problem as who would really want to go backwards in a game. I did it mainly because I thought I missed a save point. Here are a few shots of what I saw. @iryan: Not sure if I told you about this, the icy rocks from DS1 and DS2 are using the same template names although the models/meshes are different (smaller for DS1, large + path-blocking for DS2). So for DS1=>DS2 maps all e.g. rock_ice_01 needs to be replaced with rock_ice_01_ds1 (goes upto 08). With search+replace across all files this can be done in a few (8) steps (honestly the choice of the custom templates names could be better for S+R, but I wanted them to be listed close to each other in SE2). About 'missing a save point', perhaps a 'sign' to indicate a start position would be useful!? On the CGM Tutorial or on Diabloish map I've used a decal, but you also could place the player chest there (I guess most players will consider it as a kind of home/save point). ...rethinking about it right now, also a custom radar icon could be set so the player can see the save point on the radar from far away already, able to make up his mind whether to play on or not. @bare_elf: Great to see your debugging screen shot! Possibily it would help Iryan if you would use the 'potion tweak' to show the mood or the position/region!? - You know, open your inventory and press Ctrl+Alt before you click on a potion. Note maybe too, remote (exp) jewels you can 'pick up' by pressing shift key while holding the cursor above the jewel (above the body, not the label) for 2-3 seconds. I wish there was a way around the tower as it seems as if I may never get through it. The first time in with my party I was killed almost before I opened the first door. I noted that about 90% of the monsters are resistant to Melee Damage, Ranged Damage, Physical Damage and Death Magic. Let us just say that they are totally protected from both ranged and melee damage, because when you shoot or chop them they get health. Nature mages have some effect though quite small. Combat mages do a bit better. After getting wiped off the map of Aranna the first time I picked up as much mana as my team could carry and went back down into the tower of Kmethekt. I got about half way through when my party was totally killed and the game asked me if I would like to respawn. Yes appears to be the wrong choice since the game locked up and I had to work almost as hard returning to windows as I did trying to kill the monsters in the tower. No sure what to do next. The Save Point system will be totally revised for the next Beta. In Ehb they've been scrapped and replaced with automatic saving as Ehb is such a linear map so it works well. I've also added the Player Chests there already, together with a flag hinting that this is a save position and the game will inform you that a "checkpoint has been reached and sames saved now will start at this position". At these points there're already merchants so it should be quite clear to the player that this is a starting point. For the other maps I'm going to try to use the DS2 teleport system, except that maybe LOA will be a mixture of both. There's already much of what's needed in place for such a system, i.e. starting positions, triggers, the save point which can be converted to a teleporter. We'll see how I go once I finished Ehb. The Rocks I will modify once I get to work on LOA again (not for quite a while I think). The locking up of a game on respawning in LOA is a known bug of the map. It's associated I think with your inability to use the Town Portal pass the first few regions. It also occurs in Yesterhaven and is mentioned in the readme. I wish I knew what was the reason and I hope somebody will be able to help in rectifying this nasty bug, otherwise LOA may never get to a finished state, which would be a pity. In the meantime I'll make a hotfix for the Tower of Kmethekt toning down the resistances. They're actually suppose to be the same level as the skeletons, etc, at 75% resistance but instead act like 100% resistance. Again I don't know why this is happening. Might be the problem with LoA and Yesterhaven. Maybe the addition of more start groups would clear it up. I was talking about the problem with the monsters in the Tower of Kmethekt. Both Dark Elf and TechieM2 suggested that the problem might be with how the Mod-Erthos-MonsterLevelAdjust-Beta4i.ds2res handles the monsters in the tower. So on the chance that it might be a conflict between the monster level adjust and the monsters in the tower, I disabled it and was able to get through the tower with a normal effort. I am out of the Tower of Kmethekt now have saved the game at the next save point, re-enabled Mod-Erthos-MonsterLevelAdjust-Beta4i.ds2res and now on with the testing. So far it looks as if it is only the monsters in the Tower of Kmethekt. Critical Errors in LOA and Yesterhaven hopefully fixed! I did test these out myself and from what little testing I was able to do both the Town Portal and Party Respawning upon defeat both work. Also it shouldn't effect your current game save at all. The problem seems to be that most of LOA's and many of Yesterhaven starting positions begin from id = 9 up. When I compared them to Ehb and the Utraean Peninsula, all of those two maps had starting position ids beginning from 1. Arhok actually did have ids beginning from 1 so that's why the town portal worked but the next starting position began from id 9 so it broke the system (incidentally all of LOA's starting positions I used were developer start groups that I merely re-enabled again so I just assumed that they would work properly). I first thought that the reason was that some of LOA's starting groups had world levels referring to elite, regular and veteran, which no longer exist but when I checked the Utraean Peninsula's starting groups, they exist there too so obviously they have no apparent affect on the game. Let me know how you go with the hotfixes. I also think I know why the LOA monsters in the Tower are so nasty towards bare_elf. Checking their templates they should have 50% physical and death resistance at normal level scaling up to 100% at elite. Compare that to the skeletons who have 25% melee, ranged and death resistance at normal scaling up to 75% at elite. I remember from early testing that physical resistance doesn't work like it should according to the documentation in components.gas, that's why I changed it for all the base DS1 monsters but forgot to do it for the LOA ones. Still we should be able to do at least half damage to them at normal level but can't and they seem resistant to elemental damage when they shouldn't be. So there's a bug somewhere, either in the base DS2 code or in the MonsterLevelAdjust that maybe using the Elite or Veteran settings instead of Mercenary. I will adjust all the LOA monster's values to be like the DS1 ones and initially send the updated DS1_Logic to bare_elf for testing before posting here. By default the LevelAdjustment mod will increase the resistances depending on the level, for example if a low-levelled monster (in merc mode) was 25% resistant to fire then this monster will be immune to fire on a high level (vet/elite mode) - at least in DS2 that\\\'s quite common. However it may be now that this marginal growth is too big. Note maybe that in DS2 resistances types dmt_melee/dmt_physical/dmt_magical are extremely low if assigned at all (can\\\'t actually remember a concrete monster). I would need more information to check this, specially the the monster/template, resistance value(s) and the average party level. By default the LevelAdjustment mod will increase the resistances depending on the level, for example if a low-levelled monster (in merc mode) was 25% resistant to fire then this monster will be immune to fire on a high level (vet/elite mode) - at least in DS2 that\\\\\\\\\\\\\\\\\\\\\\\\\\\\\\\\\\\\\\\\\\\\\\\\\\\\\\\\\\\\\\\'s quite common. However it may be now that this marginal growth is too big. Note maybe that in DS2 resistances types dmt_melee/dmt_physical/dmt_magical are extremely low if assigned at all (can\\\\\\\\\\\\\\\\\\\\\\\\\\\\\\\\\\\\\\\\\\\\\\\\\\\\\\\\\\\\\\\'t actually remember a concrete monster). For the majority of monsters I think the resistance scaling from your mod is fine. I have a mid level party for testing around level 45 and most other monsters are defeated easily enough. I think it,s just that particular resistance type of physical which has a bug in it, I dont think any DS2 or BW monsters actually use that value. The resistances are one of the things I really like about DS2 as it was a lacking feature of DS1. It allowed me to give monsters resistances that make sense for their environment, like snow living monsters being resistance to ice but weak to fire, and Rock Beasts resistant to melee and ranged as they are made out of rock or stone after all. For undead I made them resistance to melee and ranged, as is the norm for many role playing games (they are dead after all and have no flesh to attack) and it does not make sense that etheral beings like ghosts are particular affected by swords and arrows. I also wanted to make having a balanced party more important as I probably used resistances a lot more in the DS1 and LOA monsters than did GPG with DS2. I originally used physical resistance as I thought it saved using melee and ranged all the time in the actor block but in seems it acts more like defense than resistance. For the DS1 monsters I changed it but forgot with the LOA ones. For the hotfix DS1_Logic.ds2res I,ll changed the values to be inline with the DS1 monsters like skeletons. Incidentally if you have any recommendations about the resistances let me know. I just used my personal preferences from my game playing with games such as Final Fantasy X & XII for the figures I used (I think it,s a pity we couldn,t take it a step further and have monsters such as skeletons strong against most melee and ranged attacks but weak against crushing melee attacks with weapons such as maces or hammers, or undead weak against healing spells, which as far as I know can,t be used as an attack spell). It seems a bug has gotten into the formatting code as I had to review this post. I installed the new DS1 Logic File Just before entering the area with the Clock. I encountered some very difficult monsters that where resistant to Melee, Ranged, Death Magic and Physical Damage. Although it took a great effort to snuff them They died and my party lived with a few broken bones and flesh wounds. Next I installed the new DS1_Legends_of_Aranna_Beta_6b.ds2res and DS1_Yesterhaven_Beta_6b.ds2res I quickly discovered that the Re-spawn works and the Summon Teleport Spell works now. With some minor issues. Both the Re-spawn and summon teleport spell take you back to the last save point. So hope when your party gets wiped out that your last save point was a town with someone who can resurrect your party or you will be running about naked and weaponless. I noted one weird position problem with Jondar. Not exactly sure how to explain it so see the image below. I,ve updated a couple of files to fix some issues that have been reported to me. The only things changed is some monster rebalancing in DS1_Logic, fixes for the Town Portal and Party Respawning Upon Death Issue in Legends of Aranna and Yesterhaven, and an untested fix for inability to talk to Maid Gwendolyn in the Broken Catacombs of Yesterhaven (which breaks a quest and prevents another one from starting) and the fact I simply forgot to include PhoeniX improved radar for Yesterhaven. Simply remove the old versions of the files to prevent possible conflicts. These files shouldn,t affect your current saved games but make backups just in case. What I have looked at so far. These files shouldn,t affect your current saved games but make backups just in case. My Saved Games where not affected by installing the updates DS1_Logic Beta 6b, DS1_Legends_of_Aranna Beta 6b and DS1_Yesterhaven Beta 6d. The DS LoA monster re-balance appears to be working As I was able to kill the Ghosts on Mount Doom I am currently working my way through the Transport Center on the Way to the tower to see what occurs there. I will re-run Yesterhaven as well to see if Gwen can be spoken to. Report on the minor updates. I decided to take a break from giggling through the Transport Center in LoA and took a side trip to Yesterhaven. I tried to go back to the Broken Caverns but did not have a save that would allow me to do that so I built a party of two level 100 rangers and danced with the skeletons all the way to the Broken Caverns and located Gwen and here is what happened. So it looks as if the fix for Gwen works very nice Iryan and the rocks blocking the impassable room was a very nice touch. The quests that did not appear before because they where keyed on speaking to Gwen now show up in my journal. Very nice work, I will come back to Yesterhaven but right now I need to find out if the monster re-balance in the Tower really works. So it is back to the giggle fest in the Transport Center. I just love the humor there. I think the rebalancing of the DS_LoA monsters has fixed the non-killable problem in the Tower of Kmethekt. This time I successfully navigated the tower using slow stealthy approach. Find a Dark Zepheryl and shoot at it from a long distance. Quickly switch my rangers to combat mages and hope that I would not run out of mana potions. Even though my 5 party members where carrying the max amount of mana the supply was exhausted about half way through. So then I would just hide and wait for the health and mana to regenerate. The only real problem I had was when I was attacked by 3 or more Dark Zepheryl, because my characters spent more time using their heal spells than their combat spells. The re-balance appears to be just right because I had to really work to stay alive, and pass through the Tower of Kmethekt. I would recommend that whatever level your party is make sure they can all function as combat or nature mages. I tested the monsters in the tower twice once with a level 35 party of 4 and a level 100 party of 5. The result each time was the same VERY VERY HARD but no longer impossible. I think you got the re-balance just right Iryan. Thanks for the feedback. I know why you're having trouble with those, I simply forgot to adjust them like the others in the update. Zephyrlls, Whelnar's Eyes, Midge Swirlings and Dopplegangers all use the DS2 shard soul as a placemarker since I lack the ability to recreate those monsters in DS2. The only difference between the DS2 shard souls and these ones is that these ones have resistances, and one of those is physical resistance, which as you know doesn't work as expected. I have discovered a problem at the Ancient Crypts. I should give you the details of the mod files, OS, and the fact that I am playing the map using DS2 Broken World. I am using all of the current files that Iryan has listed in this thread and all of the files that Killer Germal has listed in the thread Utraean Seizure of hopeless Mapping. The OS is Windows XP. The problem is that the first two doors in the Ancient Crypts do not open, but can be walked through I discovered this when the gargoyles waiting behind the door started flying through them as if the doors where not there at all. So I walked through into total darkness. See the screen shots. Could this possibly have the same reason as the door matter on Arhok XP? (as PhoeniX reported, actually in v2.3/addon only). The work-around was to check the door orientation, to re-set 0 instead of -9.75132e-007 for example (as may happen sometimes occasionally). Assumed such an 'almost zero' is causing path-finding problems with the addon I wouldn't be surprised that path-blocking doesn't work neither. The room behind most probably remains black because you need to use the door to fade it in (or to activate the fading trigger). The path through the Ancient Crypt worked at one point, As I played it once, however when I went back to it after installing some of the updates listed above by Iryan I discovered the problem. I guess I should go back to some earlier versions of the mods but not sure which one might be making the problem. Might it be DS1_Legends_of_Aranna_Beta_6b.ds2res or something else? The problem with the Ancient Crypts is not related to DS1_Legends_of_Aranna_Beta_6b.ds2res because I disabled it and re-enabled DS1_Legends_of_Aranna_Beta_6a.ds2res, Started a new party just to make sure and journeyed again to the Ancient Crypts and found the same problem. I know at one point I passed through the Ancient Crypts in DS2 but can not remember which mods or what versions where loaded, I did not take any notes :lightning: because it was working :roll: Hope someone can de :construction: the problem. Thanks for finding this bug. I can confirm that the bug does definitely exist but that it only occurs with Broken World. Basic DS2 works fine and since I use just vanilla DS2 to test this mod this bug never occurred for me until now. Killergremal and myself were primarily concerned with making sure that the mod works for everyone, even if they didn't have the expansion. I think both of us assumed that if it works with vanilla DS2 then it should work with the expansion. Obviously this assumption was flawed. Has anyone any idea of what might be causing this bug? As Bare_elf mentioned it acts just like that the fade_nodes trigger isn't working except that the doors are present and can be walked through by both party members and monsters. I'll play around with some things to see if I can work out a solution but someone may already have some idea of what's occurring. *Update* I think I've worked out what's causing the issue. I've sent an updated version to bare_elf for testing. The problem is solved with the doors in the Utraean Peninsula Ancient Crypt when playing with DS2 Broken World the doors work correctly and everything. Should I find my DS2 Disk and test it that way of will the change you made alter standard DS2? Please let me know. This may be the reason for the door and elevator problems I kept encountering in Return to Arhok as well. Will have to do some more tests running the DS2 shortcut and not BW. I cannot get any map to load using the DS2 executable. Not even DS2. But all maps load and play using BW executable. :? I chose map, enter mercenary difficulty, then get booted with an exception error. Ehb, Aranna and Yesterhaven do not even appear as a choice for DS2. Edit: For clarity, it is v2.2 also. Saw your problem PhoeniX and decided to check. That's good that it solved the problem. I'll update the main file list. And it won't effect basic DS2 at all. It was the only difference between the modded Utraean Peninsula and original Multiplayer_World from DS1. I honestly didn't expect it to make any difference to the problem, I just started from the only thing that was obviously different between the two versions (pertaining to the doors and fades). I verified earlier that the problem wasn't DS1_Multiplayer_World_Beta_6b.ds2res as I removed that from the resources folder and was running with just Mod-DS1Map-Utrea-Alpha10.ds2res (testing the map was super easy with this as there wasn't any monsters at all), then I verified that the problem wasn't with DS1_Logic.ds2res as I removed that as well. Why sound_dist_min caused this problem in Broken World I don't know or even what it purpose was for as I don't think it exists in the doors of any other region (assuming that this was the problem of course). With the private Betas I was using Broken World for testing and only switched to vanilla DS2 when Killergremal convinced me that having backward compatibility for anyone not owning Broken World was important (ie. those who purchased the combined pack from steam). Hi PhoeniX. Do you mean even vanilla DS2 won't load? Looking at your file list everything seems to be in order. There's a couple of bytes difference between your Logic.ds2res and Objects.ds2res compared to mine but that may be region specific differences as I'm in the Asia-Pacific region. The mod files are identical though you don't need Terrain_DS1.ds2res as Mod-Terrain_Node_DS1LoA-Beta3.ds2res contains all the DS1, Yesterhaven and DSLOA terrain that doesn't already exist in DS2. I would start by removing that file, perhaps it's the culprit for the exception error. Voices_DS1.ds2res also isn't needed as DS1 voices don't seem to work in DS2 unless they're converted and located in the npc folder in Sound/Voices. Though having this file shouldn't cause any issues as DS2 would just ignore the files. As for the maps not appearing in DS2 I have struck this phenomenon with one of my test maps. It loads in SE2 and Broken World but won't appear in vanilla DS2. I didn't lose much sleep over it as it was just a test map but maybe there's a connection as the last time I made a test map from scratch in the editor it wouldn't load in DS2 either (but would in BW). Terrain_DS1.ds2res was the culprit for even vanilla DS2 not loading. The other maps not loading were from a mistaken assumption of mine. I assumed that since I installed the game with the Dungeon Siege II Deluxe Edition (DS2/BW) that v2.2 would be installed. This was not the case, I was running v2.0. I downloaded/installed patch 2.2, and all maps are now selectable, as well as my logic.ds2res increased by 5kb and my objects.ds2res increased by 1kb. Edited for mathematical purposes. Did have "Deluxe Addition" and not "Edition".